A QR Code - I dare you to scan it! QR Codes are those funny square barcodes that have popping up on magazine ads all over the place for couple of years now. The idea is to allow an easy way for smart phone users to enter a web address or contact information by just “scanning” the code on the printed page. A paper hyperlink if you like. Unfortunately, there seems to be huge misunderstanding about how QR Codes are actually used in the real world. This leads to an unsatisfactory user experience which hurts the brands involved and the entire concept of QR codes. QR codes have enough problems without brands making things worse! QR codes are a short term fix until smart phones are clever enough to read and follow printed links for themselves. This technology is very nearly there, but until it is all the way there we are stuck with QR Codes. To make matters worse, there are two competing systems: the Microsoft Tag and the more conventional black and white QR codes that everyone but the Microsoft fan boys use. There are four huge implementation mistakes that I see on a daily basis – I have got into the habit scanning every QR code I see in the hopes of seeing something cool, but mostly so I can feel superior to whomever implemented yet another bad QR code. Yes, I kid you not. Considering how expensive ad space is in most magazines and newspapers it always amazes me when I see QR codes that are so small that my iPhone 4S (arguably one of the most advanced smart phones currently out) cannot focus on them. I do understand that ads get re-sized for different magazines and different months but that copy often stays the same, but it all just feels lazy. Get rid of the QR code for crying out loud if you are going to perform a major re-size on a regular basis. Think of it as printing the wrong phone number or web address. QR Code Mortal Sin #2 – Not having a landing page that is optimized for mobile devices. What is the basic concept of a QR Code? To get a user to take out their smart phone and try to interact with your brand! So why make the experience horrible by making them constantly re-size and peer at a tiny writing on a tiny screen?! QR Code Mortal Sin #3 – Using QR codes in Stupid Places. Why, oh why, oh why, would you put a QR code in your email signature? Who is it for?! Are you really expecting a user to open up an email from you on their computer, see the QR code in your email signature, and then get out their smart phone and then try and scan the code from screen of your PC?! How about a simple link in your signature instead that you can just click on, or when you get the email on your smart phone, just touch! Because you can add a QR Code to your emails doesn’t not mean you should. This also goes for using a QR code for a picture on social media sites or on billboards on the side of the freeway. QR Code Mortal Sin #4 – QR Codes that give a page not found error (also known as a complete waste of everyone’s time). Nobody wants to do this! As a little experiment, I scanned all nine QR Codes in the May 2012 edition of Veterinary Practice News that flopped onto my desk the other day. I used my iPhone 4S and the QR Reader for iPhone App by Tap Media (one of the most popular readers on the App Store) and if I encountered problems I also tried Red Laser App that includes a QR code reader. For Microsoft Tags I used Microsoft’s own reader App. I only one bad URL during this test, and that was solved by using a different app do kudos to everyone involved for avoiding the most heinous of the QR Code mortal sins! Unfortunately, the new app just brought me to a slightly more involved , but admittedly mobile friendly, version of the same ad I was already looking at (this actually happened to me twice during this experiment). Points for mobile friendly chaps, but a little originality would not go amiss either. I only had one QR code that was too small and therfore impossible to scan with any of the apps – they shall remain nameless but will surely burn in hell. Sadly, five of the QR Codes I scanned led to non optimized sites that were difficult to interact with on a mobile device. That leads me to believe that someone in a meeting somewhere said “we need to have QR codes on our ads because they are cool,” but did not actually think about what they were actually going to use the QR Codes for. One company, however, did a really nice job however: Erchonica – who make cold lasers for wound therapy. They used both a standard QR Code and the Microsoft Tag which led to an optimized YouTube page with videos of Erchonica’s lasers in action. Very simple idea , and gave the reader something that they could not get with the printed page – video. Interestingly enough, another QR Code I scanned also took me to a YouTube page – however it had not been defined as a mobile page which seemed like significant missed opportunity. So nice job Erchonica – I even watched the video! 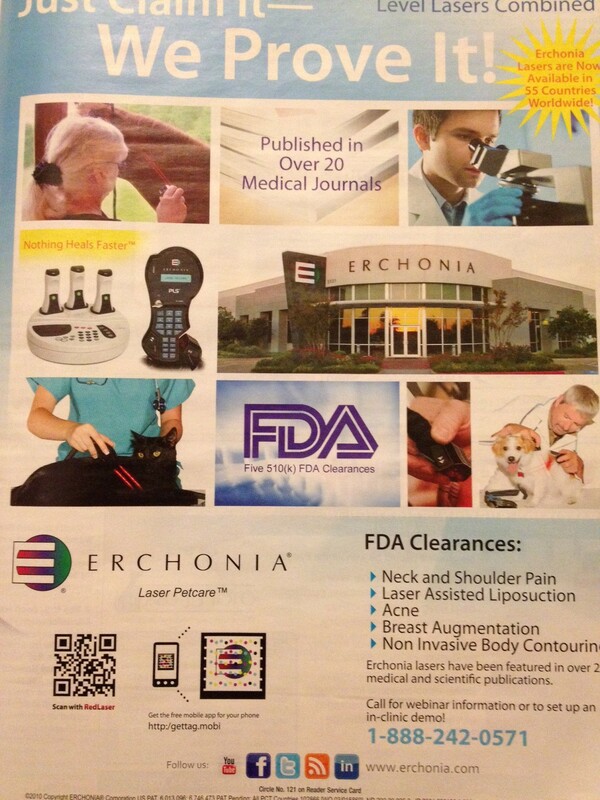 The rather nice implimentation of QR codes on the Erchonia ad in this month's Veterinary Practice News. The bottom line of all this is that QR Codes can be a great little tool but are seriously misused. This hurts wide scale adoption and wastes a lot of time, energy, and money. As for the title of this post? I invite you to watch the great Scott Stratton, who is responsible for my current obsession with QR Codes, on the subject. Nice points Mike! 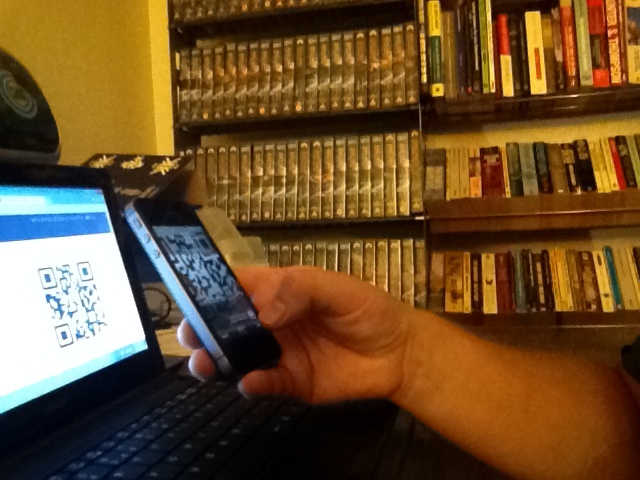 I have found two alternative uses for QR codes that work with our business cards and appointment reminder cards. 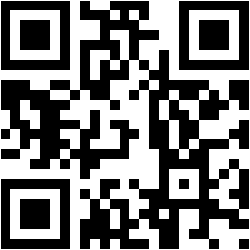 We are using a QR code on all our business cards that download a Vcard to the Smartphone’s contact list. For our reminder cards, if a client needs to reschedule an appointment, they can scan the printed QR code to direct dial the clinic. One of the best uses of a QR code I have ever seen was last summer when a local restaurant was getting ready to open, they created a banner with a giant QR code that was scannable from your car as you sat at the stoplight’s intersection. It landed on a page that previewed the coming restaurant’s menu and gave details about employment opportunities. It created buzz in the weeks leading up to the grand opening. Thanks for the ideas, feedback and kind words. I think there are lots of cool things you can do with QR codes – a coupon on your closed sign is one of my favorites – but there is a lot of dreck too: hence the post. I’ve been showing my paintings at local cafes, and I started putting a QR code on the info tag by the painting. I usually have a place in the shop to put business cards, but people may not always see them. If they scan the QR code it takes them directly to the Etsy page of the piece, where they have option to buy, and definately have an easy way to remember the painting and track me down. And I have learned the hard way, size does matter! I think that’s pretty awesome. Good luck with the painting! Here is a great QR code idea from a Holiday Inn I visited..A QR code to the TripAdvisor link so you can write a GOOD review. I am advising this for my clients and students so the clients who complement us can easily pop over to Yelp and add a love note. Great idea – just be careful to test it out. I don’t think Yelp allows you to post a review from a mobile device. Will do! No too smart on Yelp’s part – we live on our cell phones! Yeah I have to agree – my understanding is that Yelp want thought out reviews not ones made in the heat of the moment. Not sure that jives with our changing world however.